So its been just under six months since the mighty Holden ute was parked in the garage and I switched to commuting full time to work on my Honda CB125E. The time has absolutely flown by for the most part and I can say that the 10,000km (over 6000 miles) Ive covered in that time has been almost completely trouble free and without incident or breakdown. In that short period of time the Honda has saved me $1820 in fuel when compared to running the Holden 5 litre back and forth to work (110km round trip) three times a week. Considering that it has become my main transport the saving is probably much closer to $3000 as I putter around doing day to day things such as shopping, socializing and work related errands but thats how it compares just on my commute. I can confidently say that by the time I have been using it full time for one full year the savings on fuel alone will mean that the bike has paid for itself, its insurance and registration with change left over to put in the bank. The holden is now considered to be in storage so the cost savings go further as I dont have its registration and insurance costs to factor in, theres about another $1900 dollars that I didnt spend. 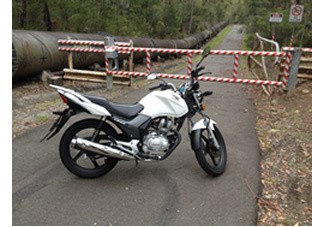 Am I still satisfied with my Honda CB125E? You bet! It gets me where I want to go, no problems. Up to this point there have been no serious problems surface on the bike. It has not broken down and starts first push of the button each and every time. This is of course the level of reliability I would expect from a Honda motorcycle that is less than a year old and it has not dissappointed me. It does however have a nagging ongoing issue in that there is a section of the drive chain that has about five links that keep stiffening up and kinking rather than going around the sprockets properly. This section is ok as long as I keep the chain well lubricated and doesnt present a serious problem. If the chain starts to go dry these tight links soon let me know. This issue started to make itself known at about the 3500km mark. Mechanically I feel the motorbike is in appropriate condition for its milage. The engine has loosened up well and has become quite responsive for an air cooled 125cc. The motorcycle achieves 90km/h on level ground quite readily whereas when it was new anything beyond 80km/h seemed a challenge. 100km/h is also possible with just a little patience. It does not blow smoke, starts easily and doesnt make any alarming noises. The chain and sprockets are beginning to wear, possibly due in part to the section of the chain that has stiff links as mentioned above. Im sure that at around 20,000km or so I will have to seriously consider replacing the chain and sprockets. I feel an aftermarket chain is going to be the best choice, nothing flashy just a good quality brand. The standard Kenda rear tyre is starting to get shy of tread in the middle as this is where it spends most of its time and will need replacement by 15,000km, most probably earlier. I prefer not to wait until the tyre is illegal before replacing it but it would be interesting to see just how many kilometres we could expect to get out of the Kenda tyres with normal use. The front tyre is still good with about 50% tread remaining. Despite the fact that I live in a coastal suburb and at one point was renting a house only about 100m from salt water the general finish of the bike is still very good, though very close inspection shows very light surface rust developing on the chrome brackets that support the headlight, the chrome tip of the muffler and the chrome heat shield on the muffler. Paint is still excellent. Its probably worthwhile to note that I wash my Honda CB125E every 10-14 days or after it has been ridden in the rain. In salt air environments this is very necessary to keep corrosion at bay. So to sum up, at the time of writing my Honda CB125E is now ten months old and has travelled its first ten thousand kilometres well, there have been no breakdowns or serious problems and for the most part the motorcycle shows minimal wear and tear and no sign of aging. So far, so good!